Giant Manta Ray populations are under increasing, unsustainable fisheries pressure in response to growing demand for their dried gill plates used as a pseudo-remedy in Chinese medicine. There is growing evidence suggesting that manta populations in regions with targeted fisheries are declining rapidly, and at least one population that was fished to near local extinction has not recovered even after decades of well-enforced conservation and management action. Conversely, manta rays are hugely valuable to coastal communities through the revenue they generate in sustainable ecotourism, particularly in developing countries. 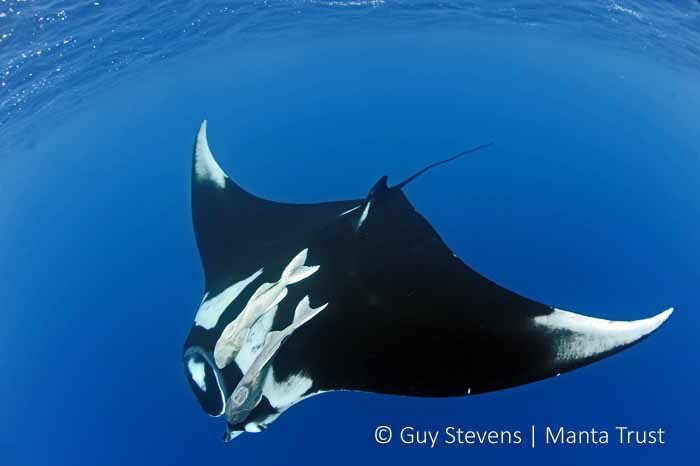 Growing, unsustainable fisheries for mantas threaten both the survival of these iconic marine species and the valuable, sustainable income they provide to coastal communities. The spatial ecology and connectivity of Giant Manta Ray populations is poorly understood, making it challenging to effectively manage the species. In order to develop conservation strategies at international, regional and local scales that will prevent ongoing declines in Oceanic Manta Ray populations, we require a better understanding of where critical manta habitats exist, whether there are hotspots that can be targeted for spatial protection, and how manta populations will respond to increasing fisheries effort at local and regional scales. Perhaps most importantly from a management standpoint, we need to determine the most appropriate spatial scales at which to manage manta populations, and which jurisdiction management should fall under—local, national, or international. While previous work by The Manta Trust indicates that Giant Manta Ray populations are largely insular with limited connectivity, satellite tagging efforts in coastal Ecuador have demonstrated regular movements between protected Ecuadorian waters and unprotected Peruvian waters, where mantas are targeted and caught incidentally in fisheries. Additionally, one individual tagged in Ecuador shed its tag west of the Galapagos Islands. The Galapagos Marine Reserve is a UNESCO World Heritage site due to its high biodiversity, productivity and extraordinary oceanographic features that result in a great variety of habitats and a unique oceanic setting found nowhere else on earth. Numerous fish species within the GMR play essential ecological and socio-economic roles in ensuring the ecosystem services provided by the GMR to the local community. Some species like groupers, snappers, and tunas are critical resources for Galapagos artisanal fishermen; others, like mantas, sharks and turtles, are essential for the tourism industry. Most of these species are included in the IUCN Red List of Endangered Species and several are listed on Appendices I & II of CMS. 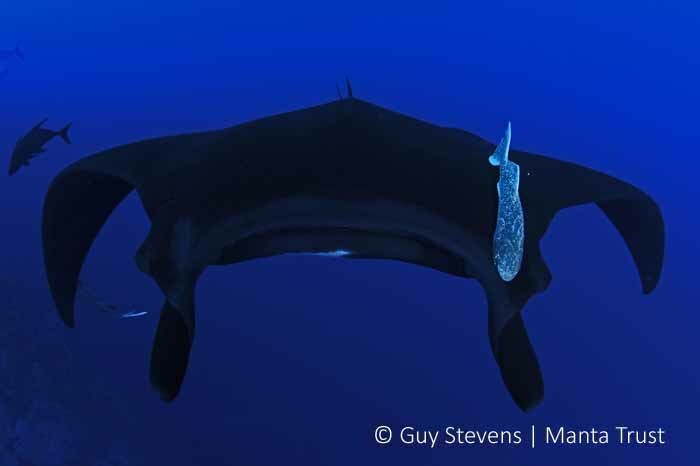 The primary objective of this study is to determine the degree of connectivity between the populations of mantas in the Galapagos Islands and coastal Ecuador and Peru, and the implications of this connectivity on the management of this vulnerable species. 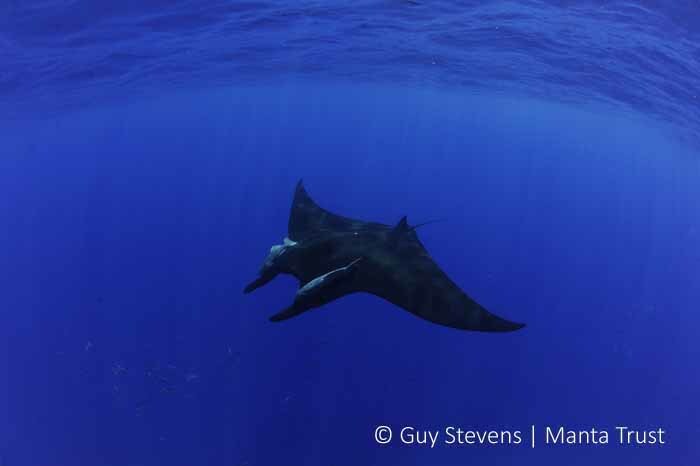 It is intended to evaluate the effectiveness of the Galapagos Marine Reserve in protecting manta rays from targeted fisheries and incidental bycatch. This project will use two complementary satellite tagging methodologies (Wildlife Computers MiniPAT and SPOT tags) to study the movements and habitat use of Giant Manta Rays in the Galapagos Marine Reserve. The Fastloc GPS SPOT tags will measure temperature and location data (with an accuracy under 50m), while the MiniPAT tags will record ambient light levels (for general location data), temperature, and pressure (depth) to obtain detailed dive profiles to determine potential diurnal migrations to feed or avoid predators.Tags will be deployed using tried and tested modified Hawaiian slings either on scuba or free-diving. All techniques implemented in this project are covered under the University of California, San Diego (UCSD) animal care protocol: UCSD IACUC Protocol #S12116 and under the Galapagos National park Directorate research permit (No. PC-22-15). Data from SPOT tags are transmitted continuously during deployment via ARGOS satellites, while the MiniPAT tags will transmit all data via satellite at the end of its deployment period (120 days). 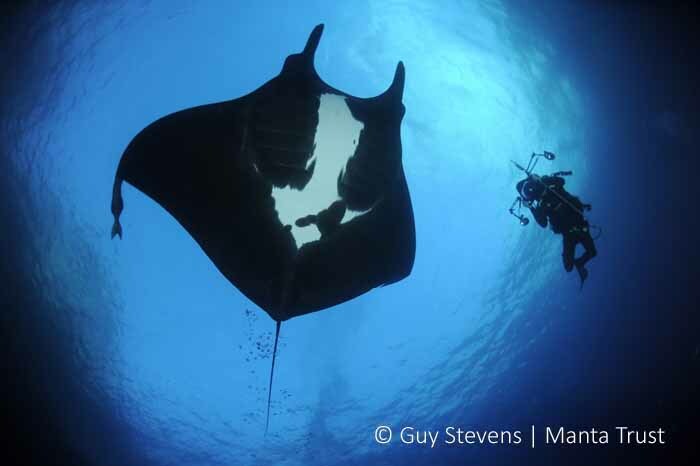 Data on Giant Manta Ray migratory behaviour, core habitat use, maximum dive depths (and temperature), and range obtained. Preliminary information on population connectivity of M. birostris within and outside the Galapagos Marine Reserve, particularly in relation to coastal Ecuador and Peru obtained. Analysis on the effectiveness of the Galapagos Marine Reserve for the conservation of marine megafauna such as M. birostris prepared. This project is kindly funded by the Government of Monaco. The Manta Trust researchers have tagged both species of manta rays in over a dozen locations globally, using a wide variety of tagging equipment; from acoustic telemetry, to mini loggers and various types of satellite tags (e.g. SPOT tags, MiniPATs, PSATs). In many cases, tagged individuals have been identified several years after the tagging event with no signs of adverse effects, further supporting the fact that tagging these animals is a minimally invasive method.